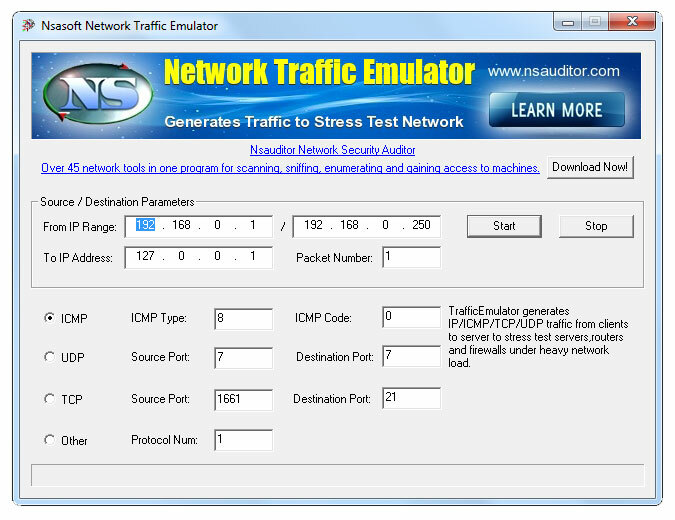 TrafficEmulator Network Traffic Emulator generates traffic to stress test routers firewalls. O in short: Nsasoft Network Traffic Emulator generates IP/ICMP/TCP/UDP traffic from clients to server to stress test servers routers and firewalls under heavy network load. It is a very simple and fast program which can simulate client activity. See above information and user's reviews about TrafficEmulator Network Traffic Emulator generates traffic to stress test routers firewalls.